Power Is The Ability To Shape Reality. 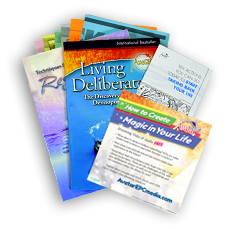 The Avatar Power Package includes: the two internationally best selling books, Living Deliberately–The Discovery and Development of Avatar, ReSurfacing®–Techniques for Exploring Consciousness, the Ten Actions booklet, the Home Study Checklist, a link to stream Avatar audio and video and information about how you can improve your life with The Avatar Course. If you are not completely satisfied, you may return the two books for a full refund and keep the rest as our gifts to you. Would you like to increase your personal understanding of life? The most important lessons you can learn are already contained in your own consciousness. TEN ACTIONS are specialized applications of The Avatar® Course procedures for non-Avatar graduates. Bulk pricing is available for this package.